Have you ever wanted to have a physique like Kris Gethin’s? Gethin is the tattooed Welsh gentleman who is a Bodybuilding.com icon and CEO of KAGED MUSCLE, a supplement company based in Boise, Idaho. He and his team have come up with KAGED RE-KAGED, a post-workout product which will blow away the competition. This is one review which will leave you flabbergasted, folks. Twenty-eight grams of whey protein isolate per serving. Three grams more than the average competitor. Has creatine and glutamine. Helps increase muscle size and improve athletic performance. Contains Prohydrolase. Digestive enzyme which helps break down protein for better post-workout results. Other Ingredients: Coconut oil powder, natural flavors, citric acid, sunflower lecithin, beet root extract (color), guar gum, silicon dioxide, stevia, sucralose. 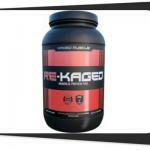 Directions For Re-Kaged: As a dietary supplement, mix one scoop in 8-12 ounces of water. Take one serving upon rising in morning and one serving immediately post workout. For maximum results consume two servings per day on training days. For non-training days consume one serving upon rising in morning and one serving mid-day between meals. It’s amusing to see big-name endorsers promote various supplement brands. We can relate: We’ve seen a plethora of reviews about these products, regardless of their prices. There’s Arnold Schwarzenneger for Arnold IRON WHEY and Dr. Jim Stoppani for JYM Pro JYM, for instance. Now, make way for Kris Gethin’s KAGED MUSCLE RE-KAGED, folks. Just so you know, Gethin is tattooed Welsh gentleman who is a regular fixture on Bodybuilding.com. He has written an assortment of articles for that website. He also has written several books about bodybuilding and fitness. From protein to pre-workouts, he has covered just about everything. Oh, and he’s the CEO of KAGED MUSCLE, a bodybuilding supplement company based in Boise, Idaho. Gethin introduces KAGED MUSCLE RE-KAGED, his signature post-workout supplement. He describes it as “a game-changing anagolic protein that you can’t live without if you are serious about adding size and strength,” per the manufacturer’s official website. BCAAs are not enough, per Gethin. You must include all of the nine essential EAAs after a tough workout to get more results. In other words, you need a full spectrum of amino acids during this important anabolic window to support recovery. No more, no less. You need a full spectrum of amino acids after a tough workout. You start with 28 grams of whey protein isolate per serving. A good number of protein supplements usually have 20 to 25 grams of protein per serving. KAGED MUSCLE RE-KAGED goes above and beyond the call of duty, folks. Impressive. Between whey protein concentrate (WPC) and whey protein isolate (WPI), the latter is the purer form of protein (at least 90 percent). WPI’s macronutrient content is lower. Thus, it is more ideal for those who want to build lean muscle. WPI is also teeming with amino acids. It is a rapid-absorbing kind of protein which helps nourish your muscles after a hard workout. Plus, it has good solubility and has no lactase content. It is the best kind of whey protein for those with lactose intolerance. You will reap all of these WPI benefits with KAGED MUSCLE RE-KAGED, that’s for sure. One major downside of this product is lack of variety: It only comes in the Strawberry Lemonade flavor. We scoured customers’ comments on the taste and an overwhelming majority say they love it. Most of them say it tastes natural. Our take? KAGED MUSCLE RE-KAGED tastes just like a real strawberry and lemonade mixture. In fact, it’s one of the best-tasting fruity protein powder flavors we’ve ever tried. You have to try it for yourself, folks. The solubility of KAGED MUSCLE RE-KAGED is also spot on. Some supplements take forever to dissolve, compromising your recovery time in the process. Not this one. We’re sure the manufacturer also took solubility as a major factor in kickstarting the recovery process. Good job, Kris and Co.
Total fat, 3 g: To be honest, we’re a bit surprised here. Whey protein isolate supplements normally have a far lower amount of fats (you’d expect them to be in the zero- to one-gram range). What was the difference? KAGED MUSCLE RE-KAGED has coconut oil powder and sunflower lecithin – two sources of good fats for a healthier cardiovascular system. Awesome. Total carbohydrate, 5 g: KAGED MUSCLE RE-KAGED is a relatively low-carbohydrate supplement at just two percent the daily value. Just wondering why the manufacturer still included sucralose as an ingredient? While it is an FDA-approved sweetener, it is not as beneficial as stevia (good the product has this). We’re left scratching our heads why KAGED MUSCLE didn’t use stevia – which helps regulate blood sugar and blood pressure levels – exclusively. L-glutamine, 3 g: You’ll benefit any time your supplement has an added dose of glutamine. This ingredient complements KAGED MUSCLE RE-KAGED perfectly because it helps restore a positive nitrogen balance, increase growth hormone levels, and prevent muscle loss. BetaPower® (betaine anhydrous), 1.5 g: This is a safe and natural nutrient derived from the molasses of sugar beets. According to Finnish food ingredient supplier Danisco, human trials involving betaine “demonstrate a significant improvement in physical performance, especially in strength, power and endurance.” KAGED MUSCLE RE-KAGED is one of the rare supplements which has betaine. Take advantage, folks. Creatine HCl (Patented), 1.5 g: Creatine increases muscle size and improves athletic performance. It’s a great ingredient to include in a whey protein supplement for even better results. Prohydrolase® (Digestive Enzyme Blend), 280 mg: According to DeerlandEnzymes.com, Prohydrolase is “effective at digesting various forms of protein including whey, soy, egg, casein, hemp, and pea.” Awesome. KAGED MUSCLE RE-KAGED has given us a great first impression. In terms of the formula, KAGED MUSCLE CEO Kris Gethin says each serving of RE-KAGED has 28 grams of non-GMO whey protein isolate, seven grams of glutamine, betaine, creatine, and the digestive enzyme Prohydrolase, per the manufacturer’s official website. He says not consuming KAGED MUSCLE RE-KAGED within 15-20 minutes of mixing will result in a bitter taste. The reason: Prohydrolase rapidly breaks down the whey protein isolate like no other. We already made it clear we like the 28 grams of protein per serving. It packs a wallop. The good news is this post-workout supplement is made even more potent with the addition of glutamine and creatine. What does this mean? KAGED MUSCLE RE-KAGED will help you build lean muscle, restore a positive nitrogen balance, prevent muscle loss, and improve your athletic performance. You will enjoy the benefits of whey protein, glutamine, and creatine in just one product. It’s great to have all three in KAGED MUSCLE RE-KAGED. Many consumers purchase separate whey, glutamine, and creatine supplements to help them achieve their fitness goals. Needless to say, that creates a massive dent on their wallets. If you take KAGED MUSCLE RE-KAGED – the ultimate post-workout supplement – you’re one step ahead of everybody else. When KAGED MUSCLE’s CEO said “the protein is hydrolyzed at the point of consumption,” it was like a breath of fresh air, to say the least. Far too many whey protein isolate manufacturers cut corners. Not this one, folks. Kudos to the company for including coconut oil powder (which increases good cholesterol levels) and sunflower lecithin (helps ward off cancer and regulate blood pressure levels) – two good fat sources. On the other hand, one gripe we have is KAGED MUSCLE did not disclose the amount of cholesterol and sodium. We feel these are very important details, especially for individuals who have heart issues. There are no proprietary blends and fillers, but the manufacturer falls a bit short in terms of transparency. We feel it would also have been better – much better – to use stevia exclusively rather than include sucralose as a sweetener. Like we said, stevia is more potent than sucralose – it is low in calories and can help regulate blood sugar levels. There’s no disputing the fact KAGED MUSCLE RE-KAGED will help you attain all of these post-workout benefits and then some. Combine 28 grams of fast-acting whey protein isolate with all of these other great ingredients, and you get one powerhouse post-workout supplement. 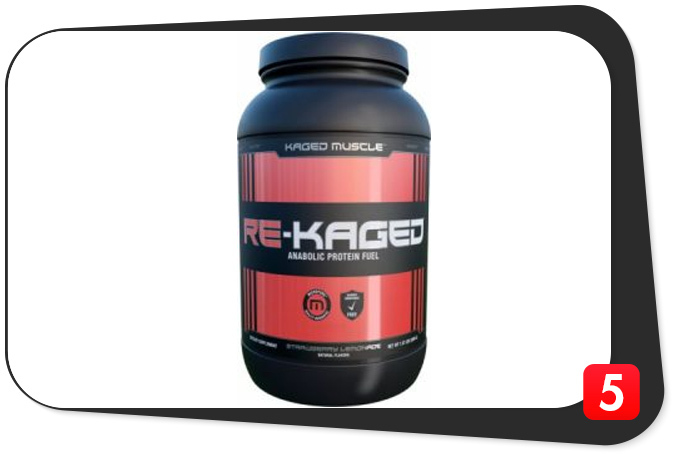 KAGED RE-KAGED is intended for healthy individuals who are at least 18 years of age who want to build lean muscle mass, boost post-workout recovery, and meet their daily protein requirements. KAGED RE-KAGED has no glaring side effects. However, the product does contain milk. Individuals who are lactose intolerant should take heed. Twenty-eight grams of WPI per serving. Helps build lean muscle mass. Has creatine and glutamine. Assists in increasing muscle size and improving athletic performance. Has Prohydrolase. Helps digest protein more efficiently. Inclusion of good fats. Coconut oil powder and sunflower lecithin, to be precise. Has stevia. Natural, low-calorie sweetener known for its health benefits. Lack of transparency. Manufacturer did not disclose sodium and cholesterol content. No variety. Available only in Strawberry Lemonade flavor. We hail KAGED MUSCLE CEO Kris Gethin for manufacturing an excellent post-workout supplement in RE-KAGED – twenty-eight grams of protein, creatine, glutamine, coconut oil powder, sunflower lecithin, Prohydrolase, stevia, etc. Simply put, folks: There’s just too many good things going on. Gethin and Co. made it clear they made KAGED MUSCLE RE-KAGED to be a “post-supplement breakthrough” which will help you gain size and strength as well as supercharge your muscles. After a thorough analysis, we are confident this product will help you achieve these with consistent use.